Its been a super long time since I've had a chance to create anything and post but I'm back, hopefully in full swing. I hope everyone has had a great start to the New Year and I'll soon fill you all in on what has been keeping me from crafting recently (in a video possibly). 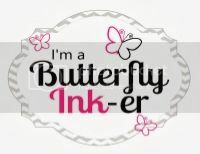 Today, I'm being featured as a Guest Designer over on the BRI Blog (BRI is short for Butterfly Reflections, Ink). I've worked with Vanessa, the owner of BRI, for quite some time and to say I adore her would be an understatement. She is absolutely AWESOME and her shop is the perfect place to pick up anything crafty you may need. And the shipping....beats them all!!! So if you haven't had a chance to check out her store, you can do so by clicking HERE. I started out with a piece of Tim Holtz Distress Watercolor Paper and used my Lawn Fawn Stitched Rectangles Dies (Small and Large) to cut out my watercolor paper and emboss a smaller rectangle in the center. Next, I moved onto my stamping and watercoloring. I did some masking while I stamped the sentiment from the Avery Elle "Many Thanks" stamp set. 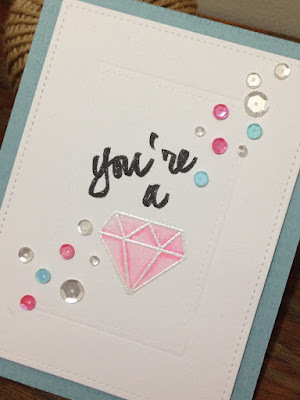 Using the My Favorite Things Hybrid Black Licorice ink, I inked up "You're a" and then used some Versamark Ink to stamp the diamond and heat embossed it with some Ranger Fine Detailed White Embossing Powder. All of the stamping was done by the newest tool in my crafting area..... THE MISTI! And you'll be happy to know that you can now Pre-Order your very own Mini Misti Tool in the BRI Store. Just click HERE and it will take you right to the pre-order. 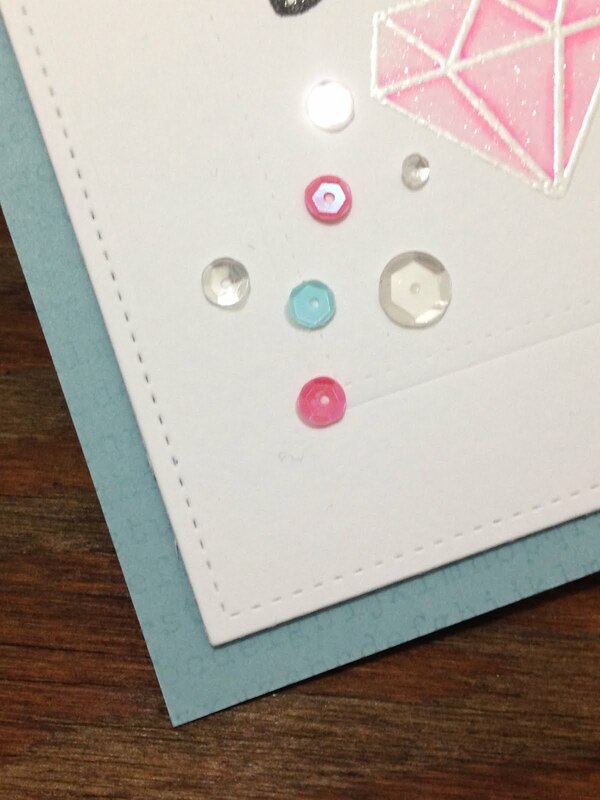 Once the embossing powder had cooled a little, I moved onto coloring in my diamond image. I wanted it to have a watercolor look, so I reached for my ZIG Clean Color Real Brush Markers in #26 Light Pink. I simply applied a little bit of the marker in the areas where I wanted it to appear darker and used my Water Brush to spread out the color and fill in all of the areas. To add a little interested to the card base today, I decided to do some watermark stamping using my Versamark Ink and the My Favorite Things Typewriter Background Stamp. I could have used a teal colored ink to do the stamping but I didn't have anything that matched quite right, so I went with the trusty Versamark. Lastly, I added some foam adhesive to the back of my watercolor card stock to give it little dimension on the card base. And we can't have a card without a little sparkle...clearly! So I pulled out some of my BRI It's in the bag Sequins in the colors, Diamonds are a Girl's Best Friend (in all sizes), Not to Burst Your Bubble, and Aqua-holics Anonymous and attached them with some Ranger Multi Medium Matte Adhesive. 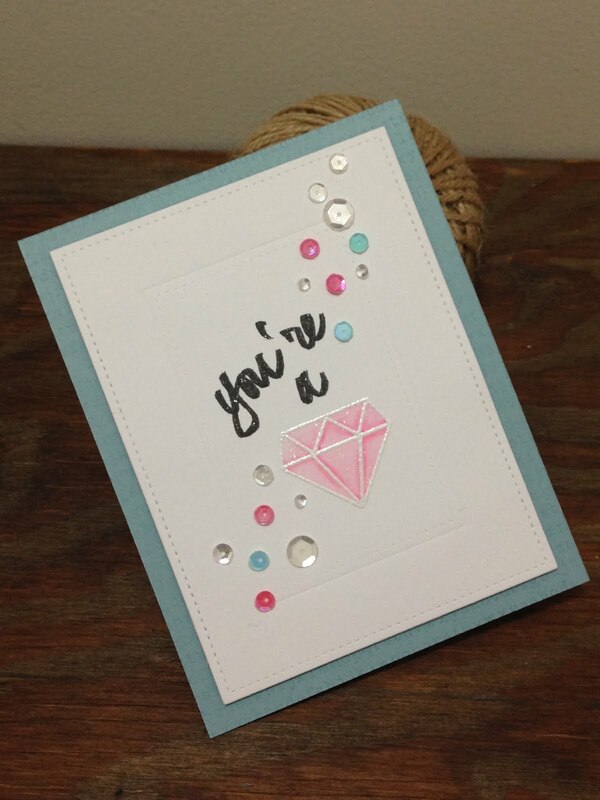 Last little touch was using my Wink of Stella Brush Tip Marker in Clear over top of the diamond and the sentiment. That completes my card for today. Hope you guys enjoyed the clean and simple look of the card. And I look forward to creating more projects very soon, hopefully with some videos to accompany them!